To keep your lawn strong and healthy it’s important to remove moss from your lawn. Even though your mossy lawn might look green and healthy, if left untreated the moss will take over making your lawn unattractive. The best time to get rid of moss is during the spring and autumn months. During autumn, your lawn is still recovering from the wear and tear of the summer months but its health needs to be maintained to help survive the cold frosts of winter. Removing moss at this stage prevents a bigger problem later on. Removing moss in spring helps to prepare the lawn for the growing season, whilst making it more resilient for summer. Aftercut Ultra Green Plus prevents moss in your lawn without scorching it, giving your lawn a better chance to achieve beautiful results. The fertiliser includes a water management technology that when watered, moisture is released and drawn deep into the soil. As moss roots do not grow deep into the soil, water is unavailable to the moss, therefore causing the moss to dry out. That’s why Moss can easily be pulled out of the ground. 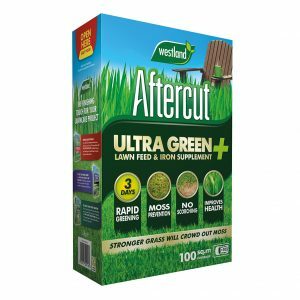 Furthermore, the feed that is contained within Aftercut Ultra Green plus helps to strengthen and encourage the grass to grow stronger and thicker and promises to achieve greener grass in just 3 days (providing the instructions on the pack are followed). If a lawn is full and thick it creates a hostile environment and crowds out the moss eliminating its chance to grow. Finally, Ultra Green will make your lawn more stress resistant so it becomes more durable during spring & summer, helping the grass to withstand drought. 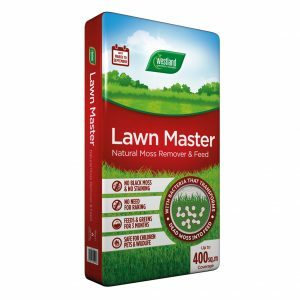 Westland Lawn Master is a no raking, no staining and no blackening formula that naturally removes moss whilst feeding your lawn. 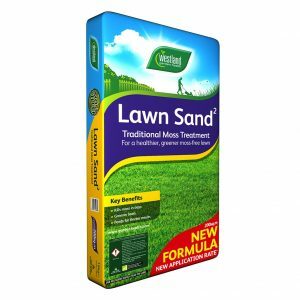 The bacteria in the product transforms dead moss and thatch into feed which in turn strengthens your lawn. The feed provides essential nutrients needed for a strong, thick and healthy lawn for up to 3 months. The product is safe for children, pets & wildlife, making it an attractive product for many families. Westland Lawn Sand is a traditional and alternative moss treatment. It can be applied to lawns whenever moss is actively growing and will kill moss in days. The combination of Iron and Nitrogen will also green up and strengthen your lawn. It’s important to understand and consider that if you kill the moss in your lawn you could be left with brown and bare looking patches. You will need to re-seed your lawn with lawn seed to bring it back to life. It is essential that you grow new healthy grass over these patches to avoid them being overgrown by moss again. 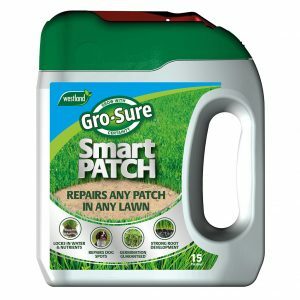 If your lawn has suffered from a high infestation of moss, use Gro-Sure Smart Patch spreader to fill in any bare patches. Its aqua gel technology and water retaining granules locks in nutrients and water for guaranteed germination results. For more information, read our article on how to repair patches in your lawn. Moss is caused by a combination of moisture in your lawn and weak grass. Moss needs moisture to spread, so you are more likely to suffer from a moss problem in shady areas or in wetter seasons like spring or autumn.